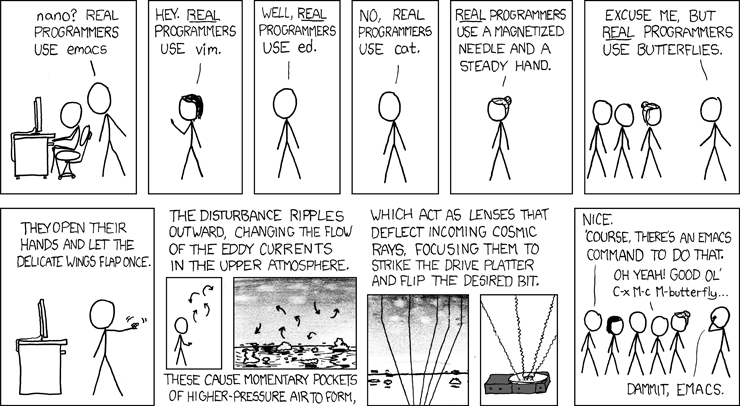 I just came across this xkcd comic about Real programmers. I started emacs invoked butterfly command and that's my first easter egg. Later I digged around and found several games & a few other easter eggs. Here are a few of them. M-x butterfly: Flip the desired bit on the drive platter. M-x doctor: Switch to *doctor* buffer and start giving psychotherapy. M-x zone: zone out completely. M-x life: runs Conway's "Life" cellular automaton. M-x studlify-buffer: stUdlIfY-RegioN stUdlIfY-CaSeS thE region. M-x landmark: Start or resume an Landmark game. M-x animate-birthday-present: Return a birthday present. M-x yow: Return or display a random Zippy quotation. 1. yow was removed in Emacs 22 due to copyright problems. But you can get it manually.